1) Why doesn’t every school provide one for every student? 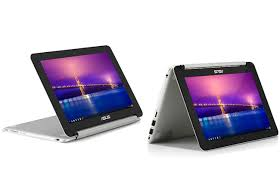 The Chromebook Flip would save schools money and provide a more effective learning tool then 20th century alternatives. No more paper, no more books. No more calculators, rulers, or lots of other costly items either when you have a Chromebook. It comes in at under $300 a year and lasts for three years. This means for $100 a year you have outfitted your students with all the supply (singular intentional) they need. And, it’s not just a replacement for traditional supplies. Instead, it provides the functionality of traditional devices and it is also a powerful creation tool that enables them to collaborate and connect with the world. 2) Why consider any other device for schools? Considering which device is right for your school? Surface, iPad, Chromebook, or the Chromebook Flip? Before the Flip, there may have been some question. The Chromebook was just a laptop. The tablet was just a tablet. The Surface was a laptop and a tablet, but has an unstable design and is pricey. The Flip has it hands down. In addition to the amazing price tag, the device has a sturdy aluminum build combined with a light weight of about two pounds. I love the keyboard and mouse and it’s a Tablet too! The battery life is outstanding at about 9 hours. In short it combines the benefits of the previous Chromebook and the iPad, and is more sturdy and less expensive than the Surface. Not only that, but for schools, unlike traditional laptops or Tablets, imaging is not costly or overly time consuming. You can set up free Google Apps for Ed which updates over the internet. Another great feature of these devices (which some are not aware of) is that you don’t need to be connected to the internet to use the standard suite of docs, slides, drawing, sheets. This is great for environments where bandwidth is an issue. The Google Chromestore, where you can download all your fav apps, is also working to make more and more apps operate without requiring internet connectivity. Not only that, but the design is perfect for students. It stands up nicely in a tent formation if you want to use it as a tablet, or you can just flip it all the way around and it’s a tablet and the keyboard becomes disabled so there is no concern of unintentional strokes. It also works nicely as a sturdy laptop unlike the Windows Surface which is unstable on the lap and in general. This resulted my Surface screen cracking. The design of the Chromebook, is built to last. If you are still wondering about things like hard drive space or ability to access the collaboration-unfriendly Office Suite, stop worrying. Browser-based that works on and off-line is the world of today. The Google Suite is available now and in the future for students and school system free of cost. Hard drives and backup are no longer necessary in this environment. The Google Chrome Flip has it all. It is the device of today’s classroom.